Implementing deep linking tools allow developers to transform their apps into sustainable and dynamic growth engines. So you have an amazing idea for an app, but where do you start? How do you make your brainchild into a reality? You’ve heard about “deep linking,” but what actually is it and why does it matter in the mobile app world? Well we’re here to teach you the basics, so let’s get down to it. A deep link is a link that directs a user to actual content. So, if you are trying to link your friend directly to a page or product in a mobile app, the best way to do it is through deep linking. Otherwise, the person you are trying to link the content to has to download the app, open the app, and search for the content from the homepage instead of being directly linked to it. Frankly, it’s a pain — particularly considering that this generation of mobile app users are in it for the instant gratification. They don’t want to take the time to find the content within the app after already downloading the app. They want the content immediately, hassle free, and without being funneled through multiple different pages. Non-deep linked content provides a poor user sharing experience, which gives your app a severe disadvantage when both acquiring and retaining users. How Can Deep Links Help My App Grow? There are currently three different types of deep links: traditional, deferred, and contextual. Traditional deep links are, you guessed it, traditional. They link users directly to content within a mobile app. However, they do not work if the user does not have the app already installed, which is where deferred deep links comes into play. The function of deferred deep links is dependent on whether or not the user has the app whose content is being linked to already installed. If the user has the app installed, he or she will be taken directly to the content. If the user does not have the app installed, the user is taken to the appropriate app store, asked to download the app, and then directed to the content that had been linked. The third type of deep link, contextual, can do it all and much more. Not only will it link directly to the content, or the appropriate app store if the app has not yet been downloaded, contextual deep linking also stores tons of user data like who sent the linked user the link, or where the user clicked on the link to see content. Why does this matter for mobile apps? Other than allowing for powerful analytics useful to developers, deep linking provides a better, more streamlined user experience and, in the mobile app world, that is everything. Finished with Deep Linking 101, but want to know more? Great! This is where Branch comes in. We live and breathe deep linking and mobile app growth. We know deep linking like we know the back of our hand, and we know the steps of making apps into growth engines as well as we know the best route to our favorite coffee shops. As mobile app developers themselves, our cofounders created Branch to help solve the many problems that developers face today, including mobile growth and the problem of mobile discovery, and they feel your pain. After creating an app and quickly discovering that sharing it and growth was far more important than the actual app itself, our cofounders took the idea of reshaping the mobile app ecosystem and ran with it. Now, app developers everywhere are able to deep link through install, improving user experience and driving countless downloads, all because deep linking was introduced to mobile apps. More than 2.1 million apps are currently active in the App Store, and with more than 50,000 new submissions every month, that number is rapidly growing. Most of these apps will fall into obscurity, with a download here and there, until their developers ultimately give up on their dream and run back to the drawing board (or their moms’ basements). But not you; you’re different. You know that to be successful, not only do you need to produce a fantastic product, but you also grow your app and somehow make it generate download after download long after it hits the App Store. You may or may not have heard the term “growth engine” thrown around by those who are already in the know. But what is an actual growth engine? How does it work and why is it important? Baby steps: a growth engine is a self-sustaining machine that systematically drives app downloads using pre-existing app users. Why is this important? Remember all of the aforementioned apps that are currently active in the App Store right now? Most of those apps don’t even have a chance of making it into the Top 1,000 Apps, let alone the Top 150 that Apple puts on display in the App Store. They’re destined to stay at the bottom of the App Store only to be downloaded once in a blue moon, and then promptly forgotten about. It’s not because all of the apps aren’t useful or great products or don’t serve a purpose — it’s because they haven’t been able to achieve the most important part: growth. So how do you beat out the rest of the developers trying to clamber up the ranks? How do you make a name for your app (and yourself)? You make your app into a growth engine. But how? 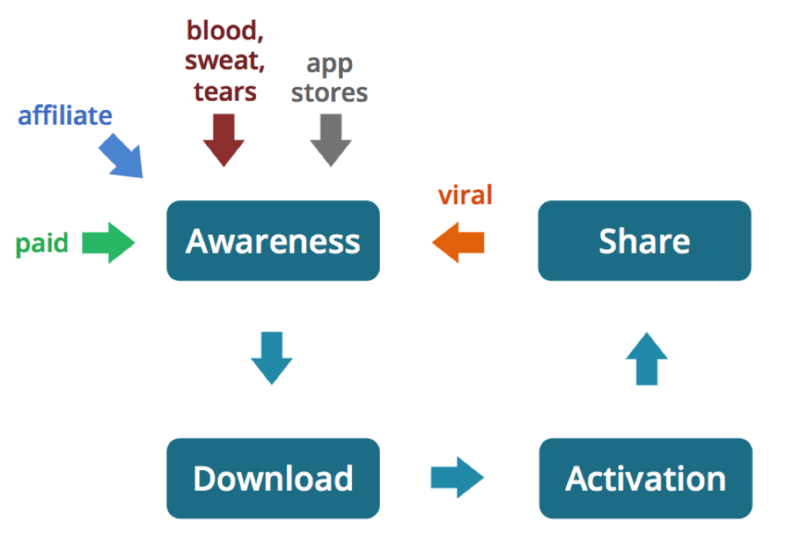 Growth engines are composed of four key parts: awareness, download, activation, and sharing. You need all four components to make your app into a growth engine. The first step, awareness, seems simple enough. You need to get your name out there. You need to hustle like your life depends on it, because for many of you, it does. Once people start to learn of your app, curiosity takes over and downloads are a natural progression. Of course, not everyone who learns of your app will download it, but deep linking and the associated analytics gives you the mobile data necessary to optimize awareness and generate those downloads that are so incredibly vital. The next stage, activation, is the tricky part. Sure, you can draw your users in with a snazzy logo, but you need to actually retain them too. No one tells their friend about a really cool app that they’ve only used once — you need to get those people to become habitual, interactive users. Finally, after activation, comes the last step: sharing. Those habitual users that you’ve created are bound to tell their friends — but it’s up to you to show them how to do it. The sharing step restarts the growth engine process by boosting awareness even more, which then feeds back into rest of the cycle. Then you’ve accomplished it— you’ve created a growth engine. Now, you may be thinking, “Okay, fine, thanks for the lecture. But you said you’d tell me about deep linking and why it’s important, but so far all you’ve done is tell me what growth engines are.” And you’re right. The title of the article is “Deep Linking’s Role in the Mobile Growth Engine,” after all. But it’s much easier to show you than tell you. Yummly, an app which allows users to discover new recipes, and 8tracks, a user-based music playlist app, both needed to solve the first step of building growth engines: awareness. They also both turned to deep linking for the solution. Anyone who cooks, whether amateur or professional chef, knows that it can quickly turn into a huge endeavor. Between discovering recipes, making ingredient lists, shopping for said ingredients, and actually preparing the meal, the time and energy it takes can be exhausting. Yummly sought to change that process — to make the discovering, planning, and purchasing of ingredients as easy, convenient, and user-friendly as possible so people could actually spend time experiencing the actual activity itself: cooking. Yummly created a partnership with Instacart to help optimize their user-experience and make it all the more simple. 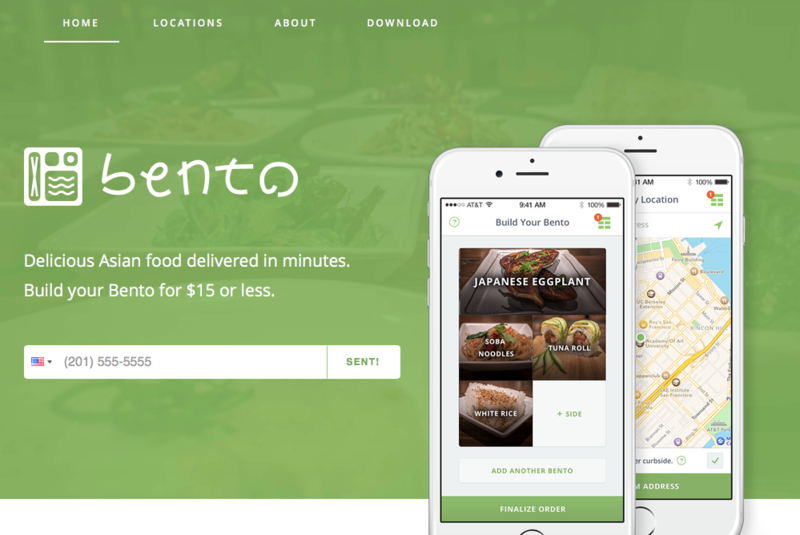 Harnessing the power of contextual deep links, Yummly created a partnership with grocery delivery app Instacart. The goal of the integration was simple: auto-populate Instacart with data such as zip code and ingredient list with the simple click of a “Shop For Ingredients” button. The button would automatically open Instacart, or the appropriate app store, with the associated data already in Instacart ready to be purchased. The Yummly-Instacart integration streamlined the Yummly user-experience, while deep linking analytics allowed Instacart to keep track of the number of downloads that were attributed to the Yummly integration. Both apps saw a dramatic increase of both user awareness and retention, with Yummly boasting an impressive 35% higher one-week retention rate for users who also use Instacart and Instacart benefiting from an average 28% increase in items added to their shopping lists while using Yummly. User-based music playlist app 8tracks also needed a way to boost its app awareness, although unlike Yummly, it was already a wildly popular web service. In order to drive users to the mobile app from the mobile web, 8tracks integrated a deep linking platform to convert pre-existing web users to app users. 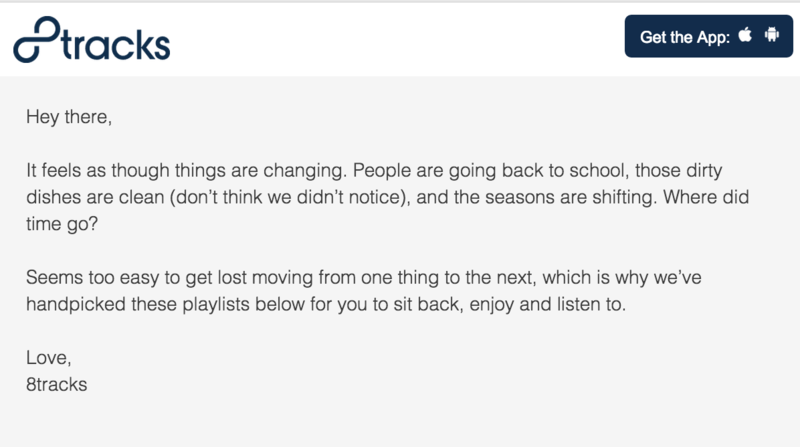 8tracks weekly user digest emails previously included two separate “Install the App” buttons: one for the App Store and one for Google Play. However, this did nothing for direct users who already had the app downloaded, nor did it track the number of installs that were generated by these buttons. 8tracks decided to use deep linking to convert their mobile web users to app users and produced a “Get the App” button. When clicked, this new button automatically directs users to the playlist they had been listening to on the mobile web in the app, which provides a superior user-experience, and provides 8tracks with data denoting how many app installs are driven by the button. Thanks to deep links, 8tracks increased their app awareness while seeing massive user retention rates across the board. So once you gain some awareness for your app, what do you do now? In a perfect world, users would automatically download apps upon learning about them but unfortunately, that’s not how it works in real life. However, there are certainly ways to increase the numbers of users learning about your app to actually downloading your app. How does this work? It’s easy — just integrate deep linking tools. Customizable smart banners allow you to pick and choose which information to add to smart banners in order to drive users to content within your apps, and ultimately drive them to download. Jet.com integrated a smart banner and now sees 33% of its app downloads coming from users who click on the smart banner. The Text Me the App desktop feature automatically detects the operating system the user is in, and then auto-directs the user to the appropriate app store, eliminating the need for the user to go search for the app. Drafted drives downloads by having curious would-be users use the Text Me the App feature when they want to learn more about the company. Creating valuable content and then ensuring your app is deep linking ready further drives downloads by indexing your app content and allowing that content to become searchable via Google’s App Indexing and Apple’s Spotlight Search. Users find interesting, relevant-to-their-interests content within the app and then download it to read more and explore. We already saw a bit how Yummly and 8tracks increased user retention by integrating deep linking tools while also increasing app awareness, but Gogobot’s deep linking experiment is truly awe-inspiring. Gogobot’s trip planning app is everything you’d want in a service to share and plan out personalized outings, but how did Gogobot convert simple downloads to interactive users? If you answered “Deep linking!” you’ve picked up on the theme. 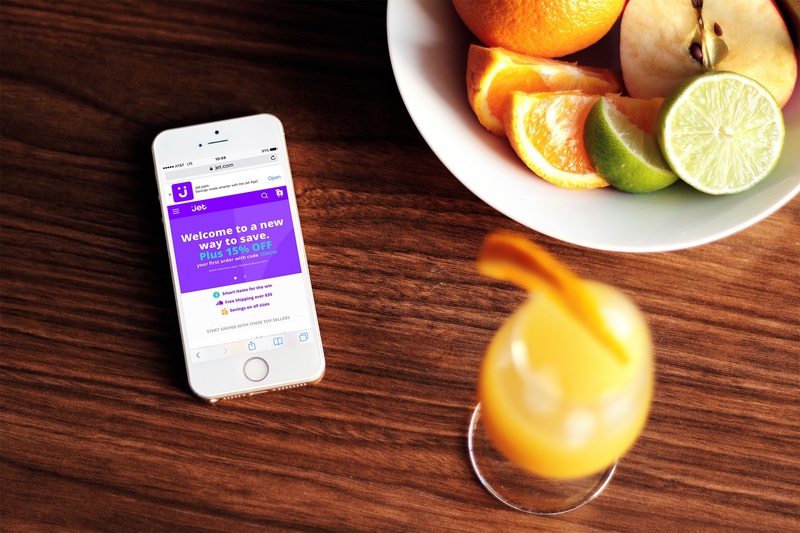 By creating personalized welcome screens, Gogobot shows users that they are actually valued as individuals rather than just anonymous users who boost download numbers. 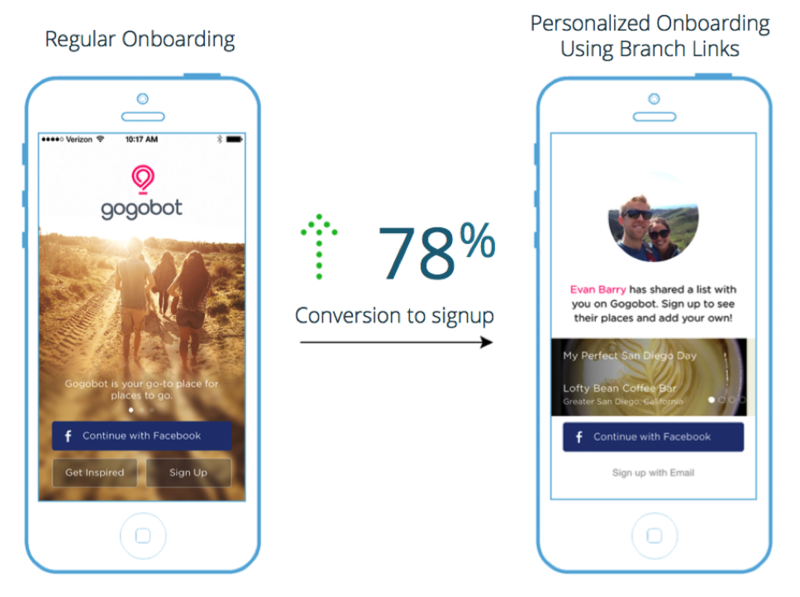 These personalized Gogobot welcome screens increased user retention by 78% compared to their default welcome screen. Remember the saying about how first impressions are everything? The same is true for apps. In fact, some mobile apps have seen an up to **103% increase in 30-day user retention** by providing new users with a great first impression of their app. Vango’s mobile art-purchasing app bridges the gap between artist and consumer. However, upon its conception, Vango developers found that what was seriously inhibiting Vango’s growth was a fundamental inability to share content across platforms. By enabling contextual deep linking, users were brought directly to the content they had been sent by other users, whether by text message, mobile web, or social media platforms, which eliminated the need to search in app for the content they have previously been enjoying. This streamlined process put more emphasis on purchasing the art rather than re-searching for it and ultimately giving up, allowing both the app and the artist to profit. As more and more Vango content was shared, more **and more artists began to use the app** which not only improved user-experience by providing more content, but grew the app itself. Implementing deep linking tools allow developers to transform their apps into sustainable and dynamic growth engines. Each step in the process is necessary, and every tool lends itself to at least one step in the journey to the once-elusive goal of mobile growth. Rosalia Quam-Wickham is a part of the Marketing and Operations team at Branch Metrics. She spends most of her days ensuring that the Branch headquarters runs smoothly. In her (limited) free time, she enjoys writing content and consuming overpriced coffee. Avijit Biswas: Thank you for sharing your knowledge. Pretty useful information indeed. Rosalia Quam-Wickham was formerly in Marketing & Operations at Branch Metrics.